All charged with conspiracy to plot a rebellion and criminal association. All sentenced to four years and six months in prison. All transferred to Viana Penitentiary on April 14. Known as “Nicola Radical”, Fernando Tomás is the oldest of the group and one of those who regularly turned out for the street protests against the government. He had been detained five times for participating in demonstrations and was subjected to beatings and ill-treatment by police officers. “He [Nicola] doesn’t even have a computer and he was never in the military”. Education: Grade 10, João Beirão High School. Albano Bingobingo became an activist in 2011, after losing his job as a driver in the security division of the office of the President. His friend and neighbour, Colonel Fuba says he was part of a group demanding better pay and working conditions who were dismissed without compensation. 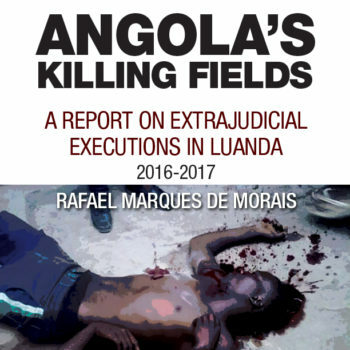 Two of that group, Alves Kamulingue and Isaias Cassule were unlawfully killed in 2012 by state security and police officers as they attempted to take part in a protest about their unpaid wages . Over the intervening years he joined in other street protests, which led to his being detained at least seven times. He suffered numerous beatings while in custody which left him with a damaged leg. While detained awaiting trial he says police stripped him naked in his cell and attacked him with cattle prods. Other witnesses then saw him dragged naked into the courtyard. According to family members, Samussuku’s father was a joker who named his first-born son after Hitler and his youngest son after Mussolini. Samussuku’s Uncle, Gideão Cauale, a deacon of the Christian Evangelist Church, laughed off the suggestion his nephew was planning a coup. “We were preparing a party for my youngest daughter. (…) The police arrived with four vehicles and took up combat positions in the street.” He asked them to show him a search warrant but was ignored. The police then took all Samusuku’s possessions, including his clothes, books, computer and discs. Samussuku’s activism began with the hip hop movement and the group “Third Division”; and with his views crystallized by his studies as a political science undergraduate, he has used a web blog and social media to air them. As a regular at the political demonstrations he suffered his share of arrests and beatings. During previous periods of detention, he used his time to teach and politicize fellow prisoners. Education: : Philosophy Undergraduate, Agostinho Neto University. Arante Kivuvu is one of the so-called ‘front line’ activists for human rights, a young man who has been arrested more than five times for protesting against the government. He became an activist after his father died and his mother moved back to the province of Lunda Norte, leaving him with an uncle. Three years running (in 2012, 2013, and 2014) he took part in demonstrations on May 27 to commemorate the MPLA purge of factionalists in 1977 and three years running he was detained and badly beaten. Since his trial, his uncle wants nothing to do with him, and he only has his sister Lídia to take him food and water.